Manco .NET Licensing System allows you create evaluation version of your product that is limited by running time (you can set expiration date or number of days before license expiration), number of runs or some features of the product. Manco .NET Licensing System can be set up to use NTP to obtain current date to check that the expiration time comes. If all NTP servers are unavailable, then system date will be used. It allows avoiding of the problem when user switches system date back to get evaluation license work more time. If some of the expiration rules became true the license expires once and forever. No expiration rules will be checked again. 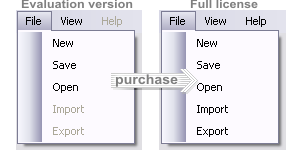 You can easy switch your application between evaluation and full functional version without creation separate evaluation version. Just use properties of the license object to detect if the application running in the evaluation or full functional mode. If license object find that user uses evaluation license it informs you about that using special properties and you can disable some important functionality.